Well, the days of considering the Hydra-corrupted Captain America a misguided extremist are over: Steve Rogers is now in the running for Marvel's most fanatical, arrogant, power-hungry, disdainful fascist. Forget being an undisputed villain - with Captain America: Steve Rogers #18 the former hero and Marvel mascot leaves any chance at redeeming himself after Secret Empire entirely behind. Taking the stage at the United Nations, the 'Hydra Supreme' doesn't seek recognition as the new power of the former United States: he demands global loyalty, screaming for it at the top of his lungs. It's undoubtedly the worst, least rational, and most erratic look at Steve Rogers that we've had in this Secret Empire to date. Whether that's a sign of the wheels of his empire coming off as the event moves closer to the Secret Empire finale, or simply evidence that writer Nick Spencer is through with subtlety... is up for discussion. But as much as the language used to dress down and lecture world leaders may sound familiar in today's American political landscape, Steve's ambition is to claim control over every nation on Earth. Given Steve's justification for his Hydra loyalty, Cosmic Cube or no, his political viewpoint is an understandable one. Yes, he may now embrace fascism, tyranny, and a dictatorship in the name of order... but take a look at the constant wars and intra-hero conflicts of the Marvel Universe, and he certainly has a point. So as Steve arrives to speak to the United Nations and through them the leaders of the world, it's not even shocking that he do so with a chip in his shoulder. He arrives "not as an ambassador, but as a courtesy." With the heroic resistance giving his Empire headaches on a daily basis, Steve makes it known that any country seen to be supporting covert missions within the United Sta-- sorry, Hydra Nation will be embargoed and sanctioned. Yet his slide from 'shrewd tyrant' to 'unhinged megalomaniac' begins rapidly, telling the nations assembled that their opinions of his rule "do not matter." Not only that, but he sees the emergence of terrorist cells throughout Europe embracing Hydra's values as a sign that they must all be given a seat at the global table. Why? Because, Steve informs these leaders, they are entering a "new era as representative Hydra nations," should they simply surrender. To Steve Rogers, who once embodied America's freedom and fought against Nazi Germany's own mission of global dominance, the countries of the world that "choose to remain stubborn" and "cling to your former sovereignty" are being "absurd," threatening to see them join his empire... or have their leaders replaced by ones who will. Unsurprisingly, the world leaders are more stunned than outraged at the presumption that Steve Rogers and Hydra are now rulers of the world. Forget diplomacy: Steve Rogers is outright threatening to remove Heads of State that don't prostrate themselves before his own values. Fortunately for the fans of the good guys, any impression that Steve's orders are coming from a place of strength is quikcly erased. When the leader of Wakanda requests the floor, Steve Rogers is sent on a one-way trip towards a total emotional breakdown, shattering his podium in a loss of composure. As King T'Challa, better known as Black Panther points out, Steve Rogers isn't the only ruler who's running out of patience. As Hydra continues to send their forces into Wakanda in search of a prize (whether it's a Cosmic Cube shard or something else is unclear), Black Panther has grown tired of slaughtering them. Issuing what amounts to a challenge, T'Challa openly dismisses Steve's posturing by requesting that either he accept Wakanda's independence... or come to face him man-to-man. Steve chooses to leave the United Nations in a huff, but gets an opportunity to flex his muscles of intimidation once more when he runs into Namor, King of Atlantis. Apparently, readers are shown, Steve would go on to destroy Atlantis and recover the piece of Cosmic Cube that its king had been entrusted with. Even though he gives up any reasonable high ground or political stance for one of total tyranny and global subjugation... Captain America is still coming out on top. 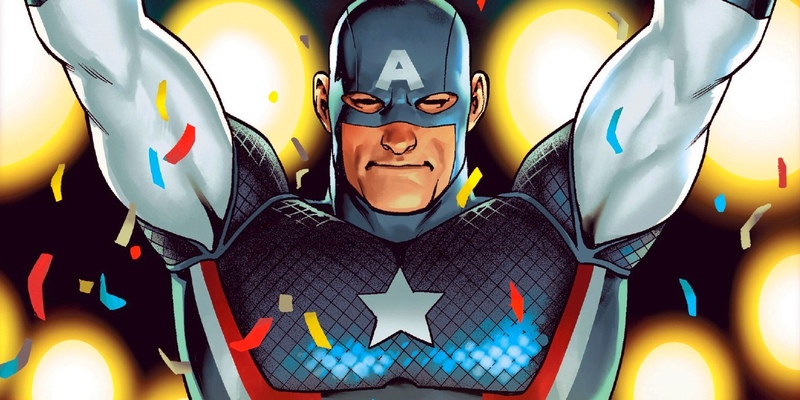 We can only hope that he'll get what's coming to him sooner or later, but as Marvel has now revealed, Secret Empire won't be the end of Steve Rogers. At least, not entirely. Whether any possibility of redemption actually exists once Steve Rogers lays claim to control of Earth's people... well, that's for the readers to decide.